You’ve seen the commercials on TV. A mature, attractive, well-dressed gentleman looks provocatively into the camera and shares his thoughts…pearls of wisdom… acquired during a lifetime of globe-hopping and adventure. 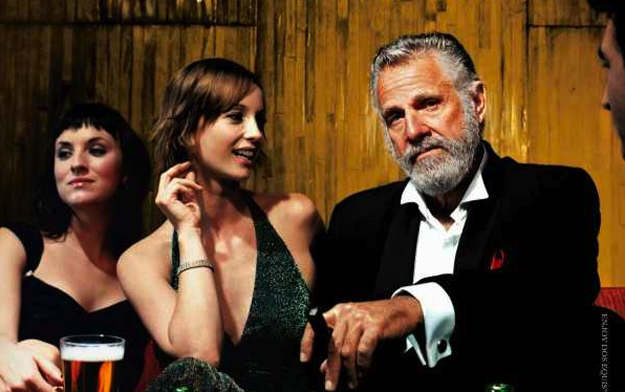 He is…The Most Interesting Man In The World. Last night, I was mulling over his latest quote - “When you pay just for yourself, you usually get what you pay for.” Taken at face value, it just implies that he gets more chicks when he buys the beer. However as I ponder further, a deeper more philosophical message is revealed. You realize, of course, I’m using the purchase of beer as an analogy for generosity. It could be beer. Or it could be something else. It could be a simple act of kindness. What it is, isn’t important. What IS important is the spirit in which it’s given. I’m not talking about blowing money foolishly, or spending cash you don‘t have in a vain attempt to buy friends, approval, or love. I’m speaking of a realistic, genuine spirit of generosity. 4. What is the minimum I must give back in return? Misers live in fear that others are out to get them. They’re always on guard…taking count…keeping score. They live for the bottom line. Yes, misers are a joy-less bunch. They insist on paying only for themselves…and they almost always get what they pay for. Could it be, that during his lifetime of globe-hopping and adventure he’s discovered the key to happiness is a joyful, generous spirit?